Transcript: These are Wilson Jones 5-tab Clear Gold Pro White Insertable Tabs! It comes with tear-off labels you can write on. Each divider is reinforced on both sides by a gold strip. The pages are three hole punched. In a standard binder, the tabs tend to stick out a little. Though they stay mostly concealed still. 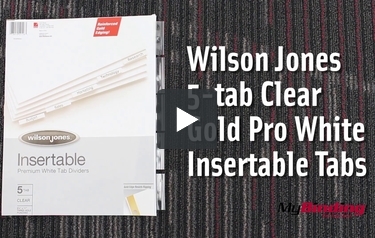 These are Wilson Jones 5-tab Clear Gold Pro White Insertable Tabs! The tabs are quite large. Slide your label in for easy organization.